Use Dura-Block® Sanding Blocks for wet or dry sanding to create a show-car finish. 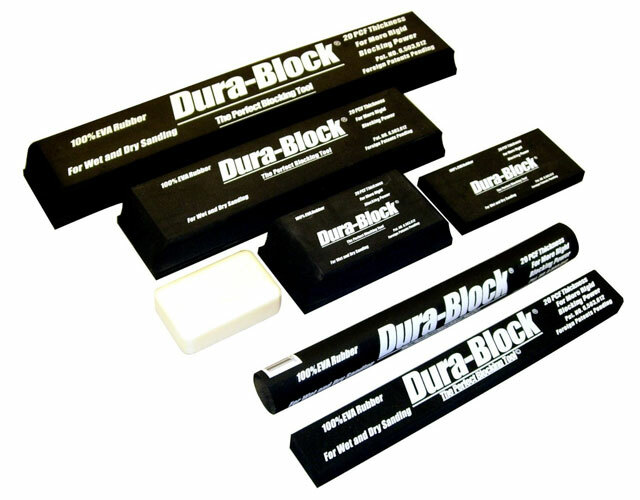 Dura-Block Sanding Blocks are molded of closed-cell EVA rubber to give you just the right amount of sturdiness and "give" as you sand, wet or dry. You'll love the fatigue-free sanding, and the final finish! Closed-cell EVA rubber creates a sanding block that provides just the right amount of support and "give" as you sand, wet or dry. Compared to working with sandpaper alone, these large, easy-to-hold sanding blocks help you work longer because there's less hand fatigue. This 7-piece set includes a variety of block shapes and sizes to help you level all types of flat and contoured surfaces, for a truly professional, show-car finish. This block is designed to follow contours or flats. No dents, no ripples. This block is designed to follow slightly curved or flat panels without digging into fill material. This block is designed to allow the user to accurately block flat panels and panels with slight curves. A favorite among the professionals when blocking large surfaces. This is the "Round" style block. Use to sand and block highly curved surfaces. This block is designed for sanding and prep work. It allows for easy use and much improved durability and firmness. The Hand Soap with Built in Scrubber! The professional hand soap with a special scrubbing pad built into every bar. Scrubbing and soaping is now done in one easy process. Always wear eye, skin and respiratory protection when using Dura-Block Sanding Blocks or other sanders. Make sure you are in a well-ventilated area and follow the safety precautions on paint and filler labels. (Q) Should I use guide coat? (A) Applying guide coat will show you the surface's high and low points as you sand. It will make it easier to identify where you need to take down high spots or add filler to low spots.